Ginger Tea is one of my favorite easy, natural home remedies. When my family has a sore throat, cold, flu, nausea or any digestive upset, I make ginger tea. 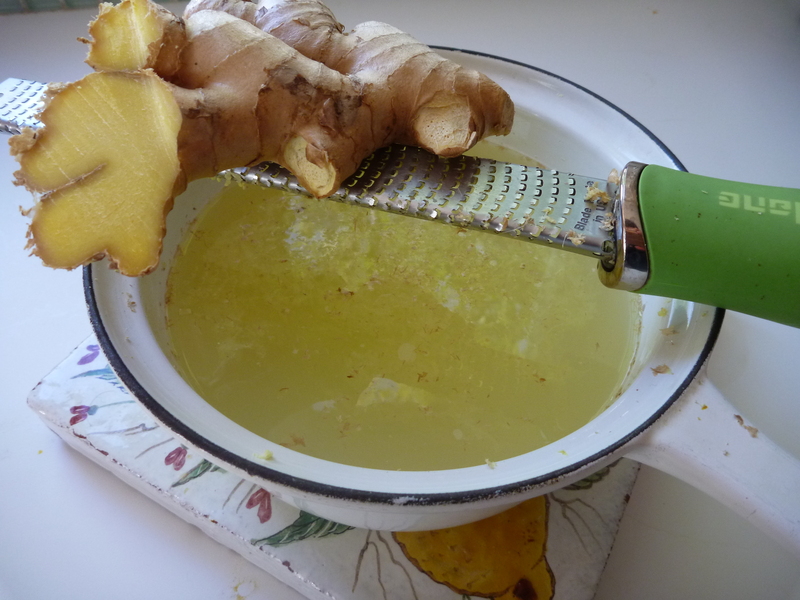 Having fresh ginger on hand is key in making this a remedy you can just whip up. The trick to having ginger at-the-ready is to freeze it! Put the whole ginger root in the freezer in a bag or container. Then when you are ready to use it, grate it, skin and all, with a microplane (a fine grater, shown in the pic above). When you grate frozen ginger you don’t have to deal with all the stringiness that occurs when ginger is at room temperature. 1-2 Tablespoons freshly grated Ginger (depends on how much you like ginger, I like a strong ginger tea, so I use 2 tablespoons of ginger). Grate Ginger (if it’s frozen, leave the skin on and use a microplane to grate) into 2 cups of water. Reduce heat and allow to simmer for 15- 20 minutes. And, if you are a lover of ginger, I think you’ll like my healthy ginger cookies. But, if you’re making ginger tea because you’re feeling under the weather, you might like to check out my post on natural remedies for colds, sore throats and feeling crummy. If you want more tips delivered right to your email box, subscribe! to my Blog. Welcome! My Body Alive Body Aware blog will give you inspiration, ideas and practical tips for a healthy and energetic life. Are you trying to take great care of yourself and your family? I have practical how-to's for you! Are you wanting to feel great in the body you have? I have inspiration and resources for you! Are you at high-risk for breast cancer? I have recipes and lifestyle tips that will bring you wellness from within. Free 7 Steps to Being a Smokin’ Hot Mom Teleclass! Gluten-free/Dairy Free Leftover-Oatmeal Muffins - Opening the door wide for health! Sign up for Free 7 Steps to Being A Smokin’ Hot Mom Teleclass!